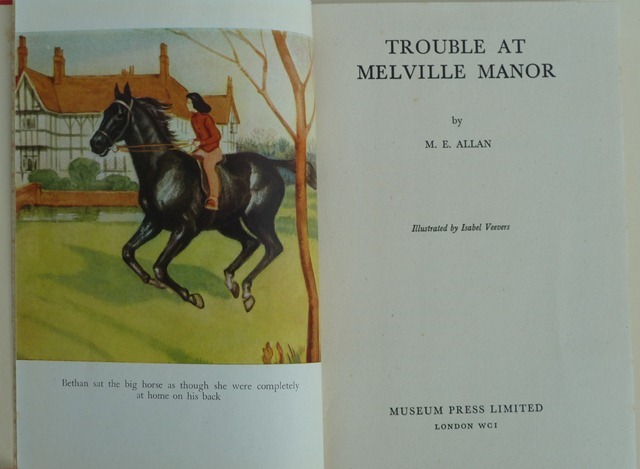 Trouble at Melville Manor was published by the Museum Press in 1949, with illustrations by Isabel Veveers. 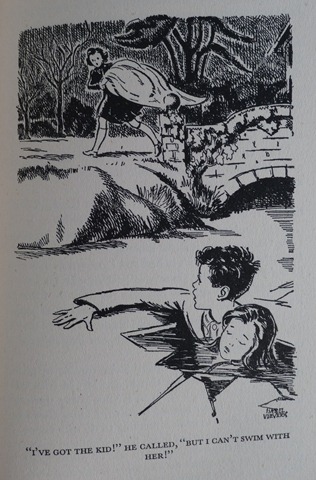 MEA doesn’t mention these illustrations in particular in her autobiographical works, but she clearly approved on Veveers’ work, as she says that she asked her to illustrate some later books, although she comments that her work was stiff (but her colours were good!) Sadly my copy doesn’t have a dustjacket, if anyone has one they can scan or photograph and send me, please leave a comment. The Melville family have to move from their home in Plymouth to the Wirral, as their father has to move their with his work. They only have a few weeks notice, so they initially stay with their father’s brother, Sir Garth Melville, at the family house, Melville Old Manor. Sir Garth’s wife has died, and he has one daughter, Bethan, named after an ancestor who disappeared in mysterious circumstances about a hundred years before. Sir Garth welcomes the family with open arms, but Bethan bitterly resents their arrival, and refuses to have anything to do with them, much to the disappointment of the children, especially Ray, who had hoped to be friends, and Gwynydd, who hopes to be able to ride Bethan’s horse. Sir Garth explains that Bethan has been spoilt by the housekeeper during his absence during the war and later convalescence from injuries he received. He sent her to school, but she was expelled for bad behaviour. The next day there is a Christmas party for the local children, but the five Melville siblings are nowhere to be found. Eventually Mrs Appledown, the housekeeper, with the aid of the Melville’s dog, Gelert, find them locked in a cellar, whence Bethan has lured them with tales of secret passages. They insist that the door was just jammed, in order not to get Bethan into trouble, and despite everyone knowing the truth, nothing is said, although Sir Garth is very cold towards Bethan. The children decide to get their own back by hiding Bethan’s new dress for the Christmas dance, a couple of days later. They intend to give it back before the ball, but they have hidden it in a suitcase which has been taken to be mended, so Bethan has to wear an old dress. The children are horrified that Bethan immediately tells her father that her dress has gone, realising too late that her standards of ‘sportiness’ are not theirs. During the dance Garth climbs on the roof to look at the party through a roof window, and gets trapped on the roof. Ray is a budding authoress, and is inspired by a story of an ancestor who fought at Culloden to write a story about his adventures, and this takes up several days of her time at this point, but she tears herself away when they are invited to spend time at the farm on the estate. Gwynedd drives the horse and cart and enjoys herself thoroughly. Sir Garth’s Christmas present to the children is a pony between them, Gwynydd is beside herself with joy. That night, Ray gets up because she cannot sleep, and sees Bethan dancing in the moonlight in the long gallery. She tries to make friends, but once again Bethan refuses. On getting back to her bedroom, she realises that Gwynydd is missing, and guesses that she has gone to see Frost, the pony. She wakes Rix, and they find her in the stable, but on the way back to the house, Gwynydd rushes straight across the frozen moat, and falls through the ice. Rix manages to get her, and hold her until help arrives. On Christmas day it is found that Bethan has disappeared, and a local woman says that Bethan told her that she was running away. The next day Bronwen tries to find her with the help of Gelert, but they end up in Knutsford, about four miles away, and have to get a bus home. Two days later the adults have gone to visit a friend, and there is still no sign of Bethan, when Ray is woken in the night by Bethan, who needs help as she has accidently set the house on fire. It turns out that she has been hiding in a secret room only she knew about, but the batteries she had taken for her torch had got damp, and she had used candles to go in search of new ones, which accidently set fire to some magazines. Later in the week Sir Garth comes to visit, and takes the three elder children into Llangollen as Ray needs to visit the dentist. It starts to snow whilst they are there, and the drive back is treacherous. Finally the car veers off the road, and Sir Garth is knocked unconscious. The children manage to raise help from a local shepherd, who leaves them in his cottage whilst he goes for assistance, and they are stranded there overnight, during the course of which Bethan finally makes friends with her cousins. When they finally make it back to Plas Llyndechan, it is to news that Uncle Garth is safe and only has minor injuries, and to a letter for Ray telling her that she has won a short story competition for under 16s with the story she wrote about her ancestor. Sir Garth admits that he found it in the library and typed it and sent it in for her, Ray is almost speechless with joy. The story ends a few weeks later, the Melvilles are living in a house of their own, and the children are at school. Bethan has a new governess at home, but has come to visit for the weekend, and all is well. The locations in the book are mostly given their real names – Chester, Birkenhead, Knutsford and Llangollen are all visited. Melville Old Manor is said to be four miles from Knutsford, and Plas Llyndechan is through Llangollen and Berwyn, then in a remote little valley in the Berwyns. 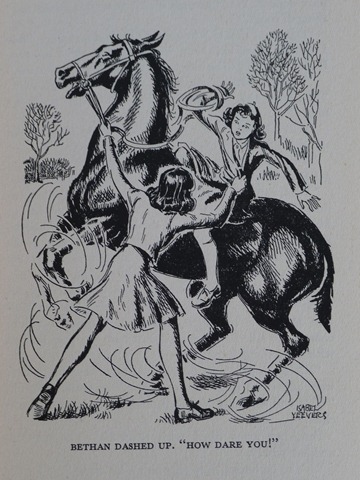 This is another book in the Girl Who Wouldn’t Make Friends (Elsie Oxenham) tradition. MEA had already used a similar theme in Glen Castle Mystery, but Bethan has no real reason for her animosity, just that she has been spoilt. The descriptions of Melville Manor are one of the highlights of the book for me, MEA based it on the house she was living in at the time, and it shows. The story is quite slight and one-dimensional, with nothing to make it particularly memorable, although it’s not unpleasant, just a little tedious and predictable (there really wasn’t much chance that the book would end with Bethan still refusing to speak to her cousins). MEA’s love of Jacobite history comes through in the detailed description of the ancestor who fought at Culloden. Ray and Bethan are the heroines of Balconies and Blue Nets, set in Brittany about three years later, and the whole family are seen at the beginning of the book.